Hallmark photo stylist Nicole Cawlfield provides a delicious and nutritious dog treat recipe made with peanut butter and pumpkin purée that is sure to have your dog begging for more. 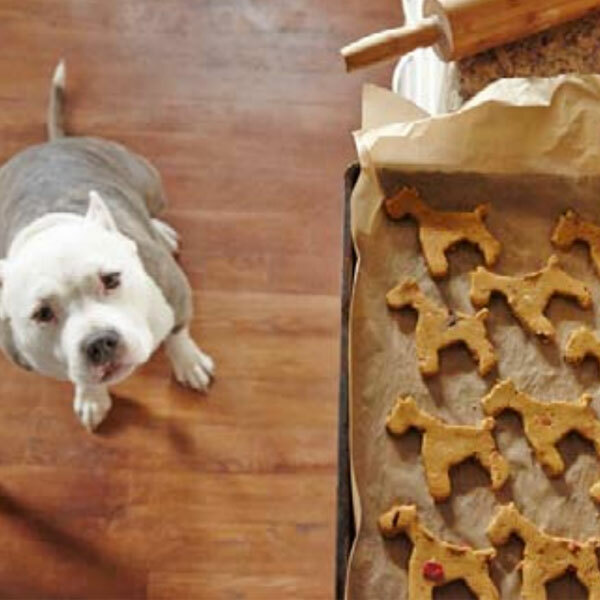 Nicole says, "Four simple ingredients will make the tastiest and healthiest homemade treats for your pups. But adding bonus items from your fridge is easy if you want to get fancy.” See the tasty twists below for add-in ideas, but remember: NEVER add in grapes, raisins, onions, garlic, nutmeg, macadamia nuts, walnuts or chocolate—these ingredients are toxic to dogs. Mix together peanut butter and pumpkin purée. Add in flaxseed and any additional ingredients of your choosing. Slowly add in flour. Dough should be a firm consistency, easily balled and not sticky. Roll out each ball until ¼ inch thick on a lightly floured surface. Cut out cookies with the cookie cutter and place them on a cookie sheet lined with parchment paper. Bake for about 20 minutes. (Add 5 to 10 minutes to baking time for additional ingredients that add moisture to the dough.) Check to make sure the cookies aren’t too soft to stay shaped. Bake for longer if too soft. Cool on a cooling rack and store in an airtight container. Refrigerate for 2 weeks or freeze for 3 months. Dehydrate apples, blueberries and carrots in the oven (or a dehydrator if you have one), and add them to the basic cookie mix. More add-in ideas: Roasted sweet potatoes, ground oats, parsley (for fresher breath), shredded cheddar, Parmesan, bacon bits and bananas. But NEVER add in grapes, raisins, onions, garlic, nutmeg, macadamia nuts, walnuts or chocolate—these ingredients are toxic to dogs.